The breadth of this market advance has been quite good as shown by the following chart of the net high – low for the last year. Looking at the next chart, which dates from 1991, you can see how the net high – low figures are the most positive in the last 23 years. 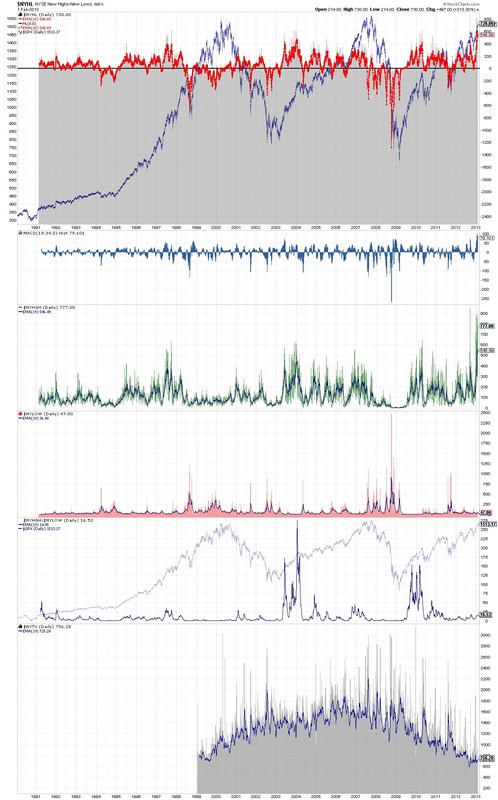 There is no StockCharts net high – low data prior to 1991. This market has a history of spiking the net high – low figures and then abruptly beginning a correction. This took place in September 2012, February 2012 and April 2010. The significant part of this observation was it didn’t mark the end of the bull market move. New price highs, which are accompanied by higher net high – low figures than previously, usually indicate that things are “probably” OK. When the market makes new price highs, which are accompanied by net high – low figures lower than the prior peak, something is probably wrong. Leading up to the peak in 2000, net high – low figures were dismal for a couple of years. The long lag time of poor data prior to the ultimate peak was indicative of how boiling hot the market was in the late 1990s. The 2000 peak was a very narrow and selective advance and it was a once in a lifetime speculative peak. Look at the chart of net high – low data during 2007. 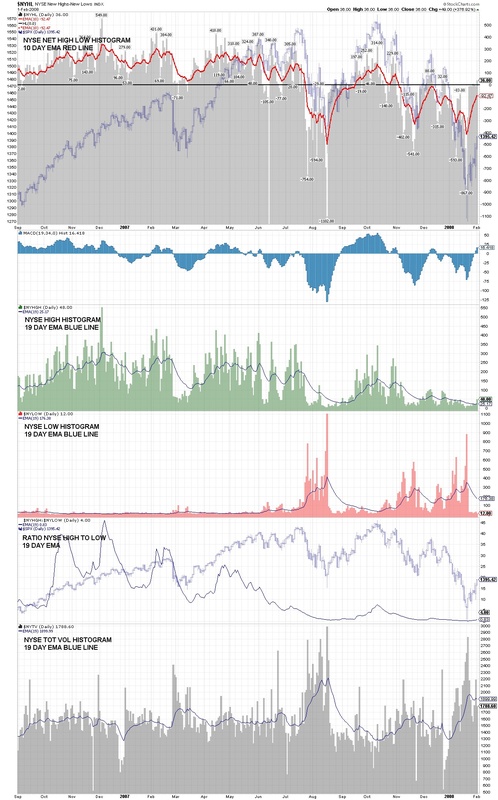 You can see how net high – low figures were indicating a peak long before the October 2007 top. The July 2007 correction was the opening act of what was to come in 2008. The rally after this correction was the last gasp of the bull and it was typical action of an approaching bull market peak. 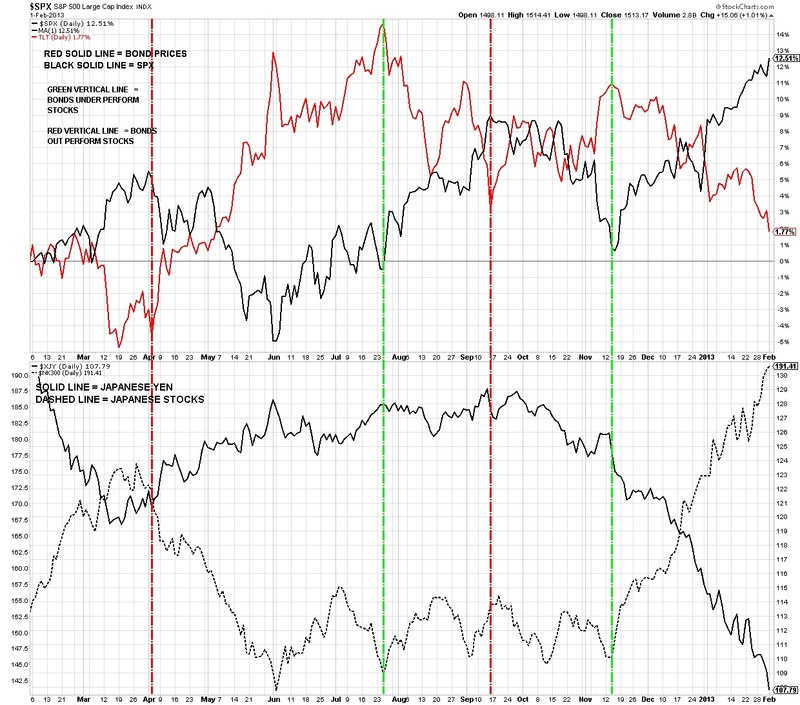 Bonds are well behind stocks in recent performance and money is apparently beginning to flow from bonds back into stocks. If that trend continues, that is a LOT of potential buying power. We’ll see how that goes. Look at the Japanese stock market since the Yen has been falling like a rock (chart #40.5). The Yen began falling in September 2012 when the Japan central bank began a new policy towards the Yen. The Japanese stock market is super-hot (up 26% in recent months) and still climbing. The following is from a news release on September 19, 2012. TOKYO (AP) — Japan’s central bank on Wednesday ramped up its efforts to spur economic growth, following similar steps by central bankers in the United States and Europe. The Bank of Japan announced it would boost the size and duration of a government bond-buying program that’s intended to encourage borrowing and spending and make Japan’s exports more competitive. Purchases of government bonds keep downward pressure on interest rates and the yen, whose rise has made Japanese products more expensive relative to other countries’ exports. After a two-day policy meeting, the BOJ said it would spend an additional 10 trillion yen on short- and long-term government bonds and bills. And it said it would make those purchases through the end of 2013, a six-month extension. The bank also eliminated a minimum required interest rate on the government bonds it buys. “There remains a high degree of uncertainty about the global economy,” the bank said in a statement. “The pick-up in economic activity has come to a pause,” it said, forecasting that activity will remain flat. Masayuki Kichikawa, an economist at Bank of America-Merrill Lynch, characterized the BOJ’s move as a “pleasant surprise.” The central bank had not been expected to ease policy until late October. Recent weak economic data and pressure from politicians worried about a further deterioration ahead of elections, expected soon, may have played a role. The U.S. Federal Reserve, similarly alarmed by chronic weakness in the U.S. economy, launched an aggressive new effort Thursday to boost the stock market and make borrowing cheaper for years to come. The Fed said it would buy mortgage bonds for as long as it deems necessary and keep interest rates at record lows until mid-2015. And earlier this month, the European Central Bank announced its most ambitious plan yet to ease Europe’s financial crisis by buying unlimited amounts of government bonds to help countries manage their debts. So is the world embarking on a reflation program that might be working?? I wonder if this is the beginning of the next bubble??? We’ll see. 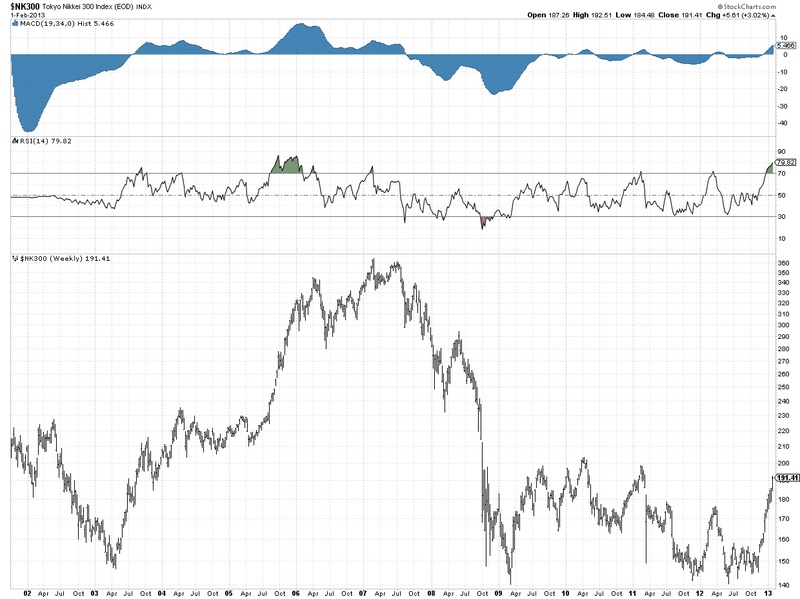 The next chart shows the Nikkei 300 since 2002. Since the bottom in 2009, Japan has been building a long base OR it just finished a 3 count to the downside dating from April 2010 to June 2012. Either way, it calls for a rally. It’s the degree of the rally that’s in question. 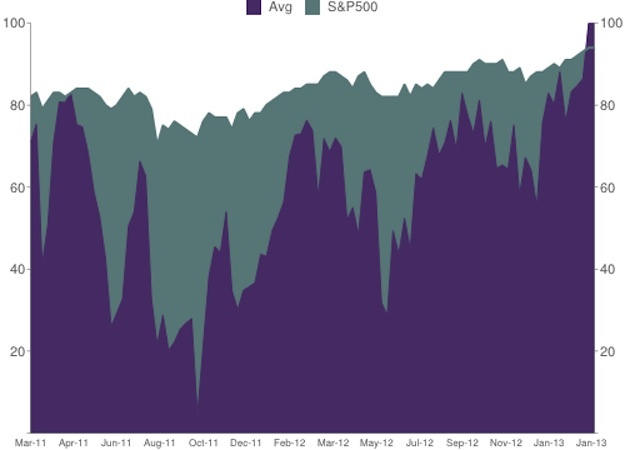 In the next chart sentiment is high as shown by the NAAIM survey of portfolio managers. These are the guys that buy and sell stocks for mutual funds, retirement accounts, insurance companies, etc. They are the “big guys”. 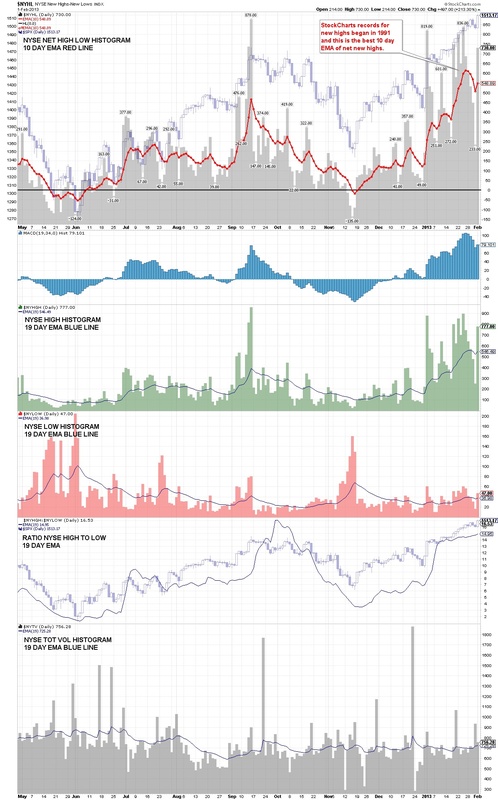 Looking at prior peaks on this chart, they began selling slightly before a market peak. But their buying begins concurrently with market bottoms, or even slightly later. The survey response can range from 200% leveraged long to 200% leveraged short. +200 and -200 are the maximum figures achievable. Presently the figure is 104 and indicates portfolio managers are all in, but they haven’t taken on a leverage position as a group. Like all sentiment figures, these are relative, meaning sentiment can always move higher before a correction, but these figures can’t move higher than +200. The news isn’t good, how can the stock market be moving up??? I was asked that question and my response was that the stock market always makes its best moves when it’s climbing the “Wall of Worry”. Here are a couple of quotes that I had to recite today. This entry was posted on February 2, 2013 at 6:14 PM and is filed under UPDATE. You can subscribe via RSS 2.0 feed to this post's comments. You can comment below, or link to this permanent URL from your own site.